As we all know, children, by their very nature, are inquisitive little people. The kitchen, with all its cupboards, gadgets, knobs and buttons can be very enticing to a little one. If you pause to remember your own childhood, the more “off-limits” something was, the more you’d be inclined to investigate! 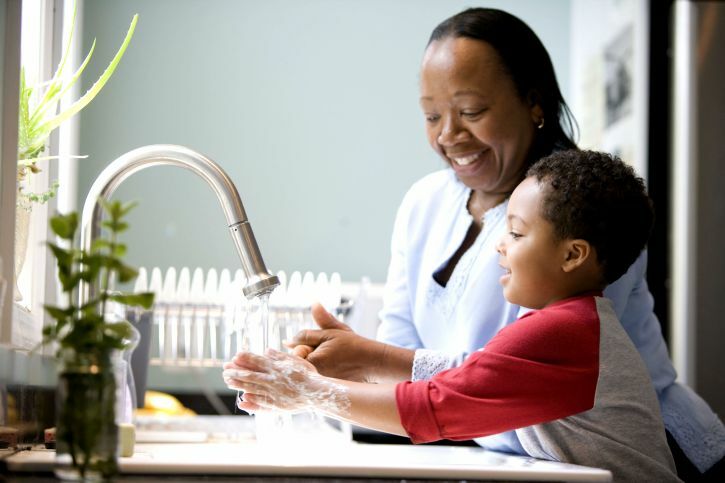 According to RoSPA more than 2 million children under the age of 15 experience accidents in and around the home each year, with more than 67,000 accidents taking place in the kitchen. Of these, the most “at risk” group are 0-4 year olds. There has been a major push recently by large washing detergent manufacturers to explain the dangers of keeping harmful powders and liquids within reach of children. It’s all too easy to store washing detergents in the cupboards next to your washing machine or dishwasher, making things simple for you, but potentially dangerous for children. Where possible, store your washing detergents and any harmful cleaning agents in a wall cupboard, or where that’s not feasibly possible, add a childproof lock to low down cupboards. Medicines and tablets should NEVER be in reach of children. Even older children should be carefully told never to administer their own medication. The best place for painkillers, tablets and medicines is in a high cupboard or mirror cabinet. Never leave them lying on a table or work top, even if your medicine bottle has a childproof lid. From a child’s perspective, a pot or pan handle will naturally look like it’s meant to be grabbed, which could lead to a very nasty accident. So always make sure your pan handles are facing inwards, and never protruding over your kitchen worktop. Teaching your children how to stay safe in the kitchen is the first step. Kettle flexes used to be another major hazard for kids in the kitchen, but thankfully, nowadays, most appliances come with a short electrical cord that shouldn’t loop over the side of any worktop. However, it is still worth checking that little hands can’t get to them. Make sure any electrical plug sockets have a childproof cover on them. Blinds may provide a convenient and stylish window covering, but they can be a real hazard for young children. If you have blinds in your kitchen, you need to ensure the cord mechanism is secured at the recommended child safe height of 1.5 metres. This can be done by simply adding a hook or curtain tie to your wall and looping the cord around it. A set of drawers left open can make the perfect ladder for your little one, so make sure you keep them closed. Ensure dangerous objects such as knives or scissors are kept in your highest set of drawers. With their flashy buttons, bright lights, and funny noises, microwaves can prove fascinating to young kids. Educate older children about the dangers of putting metal in the microwave, and make sure it’s well out of reach of toddlers. Follow this simple but effective advice to create a kitchen that’ll help you and your children make memories together.